RO Air Gap for Mountain Plumbing Point of Use Faucets. The Mountain Plumbing Air Gap AG600S does not work with any of the Little Gourmet Hot or Hot/Cold faucets (MT540, MT550, MT640, MT650). 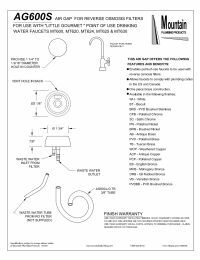 If you have or are purchasing a Little Gourmet faucet and would like an air gap, we recommend the Twin Inlet High Flow Dual Air Gap. The Mountain Plumbing AG600S is compatible with the MT600, MT610, MT620, MT625, and MT630.